PITTSBURGH (AP) — Xavier Johnson and Trey McGowens committed to Pittsburgh within a week of each other last spring, won over by new head coach Jeff Capel’s enthusiasm and hardly bothered by the prospect of trying to earn their way into the starting lineup. They spend copious amounts of time in the gym, determined to be part of the turnaround the Panthers have tasked Capel with orchestrating following the program’s freefall under former head coach Kevin Stallings. While the polish isn’t quite there, the effort certainly is. McGowens scored 17 points, Johnson added 16 points, six assists and five rebounds as Pitt pulled away in the second half for a 69-53 victory over Youngstown State on Tuesday night. During one 10-second sequence in the first half Johnson blew a dunk, raced back on defense, grabbed a rebound and rather than flip the ball ahead to Kene Chukwuka for an easy layup took it up the floor himself. His attempt to wrap the ball behind his back ended up with the ball sailing out of bounds due to a turnover, and yet he remained in the game. Taking over a program that went 0-19 in the ACC last year, Capel cautioned it will take time for the Panthers to climb their way back into relevance in arguably the nation’s toughest conference. He stressed there are no shortcuts and his starting lineup may have indicated his commitment to a long-term rebuild, though the first step ended with Pitt picking up its first victory in 319 days. The Panthers sent three freshmen — Johnson, McGowens and Au’Diese Toney onto the floor — and Capel substituted liberally trying to get a feel for what he has on his hands. 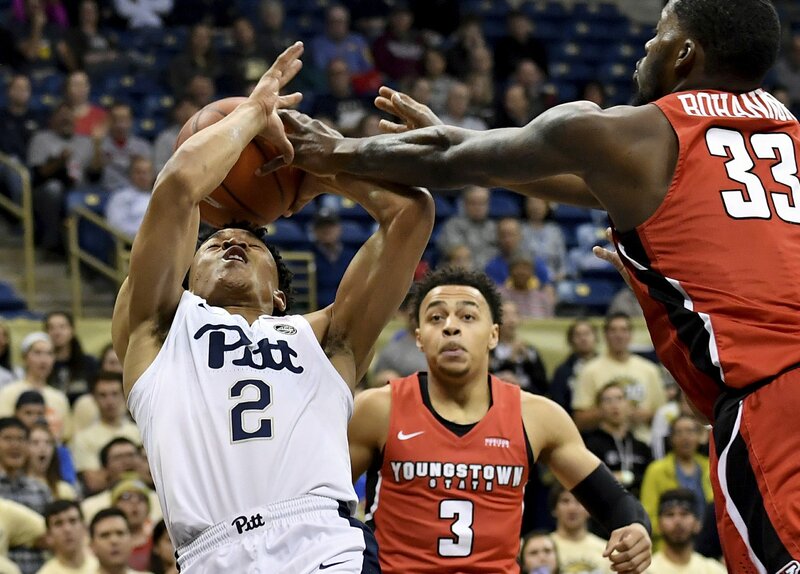 Malik Ellison, a transfer from St. John’s, scored 13 for Pitt as the Panthers used a 12-0 run early in the second half to take control after the Penguins briefly tied the game at 27. Chukwuka provided a jolt off the bench, finishing with seven points and eight rebounds. Kendale Hampton had 15 points off the bench for Youngstown State but the Penguins shot just 27 percent (18 of 67) from the field, including 8 of 38 3-pointers. Youngstown State actually had more turnovers (20) than made baskets. Pitt wasn’t much better for long stretches but was never threatened after a Johnson-fueled burst put the Panthers up double digits. The Panthers played without senior forward Jared Wilson-Frame, suspended one game for a violation of team rules. The absence of Wilson-Frame, the leading scorer last season on a team that went winless in the Atlantic Coast Conference, gave Capel a chance to experiment extensively with his lineup. Toney had 12 points and nine rebounds while starting in place of Wilson-Frame, though Capel said Wilson-Frame will be back with the team on Friday against VMI. The college season started a week earlier than usual, and the rustiness showed. It wasn’t just the turnovers. Capel counted at least a handful of layups the Panthers missed and flow was hard to come by. Youngstown State: The Penguins are in the midst of a rebuild of their own under Calhoun. Youngstown State has just four players back from a team that was 8-24 last season. Calhoun is committed to having his team chuck it from deep, though a couple more 8 for 38 performances might force him to reconsider. Pitt: Capel’s arrival brings energy and the schedule over the opening weeks isn’t exactly daunting. The Panthers don’t play a Power 5 team until facing Iowa in three weeks as part of the Big Ten/ACC Challenge. By then Capel may have some semblance of a rotation. Youngstown State: Faces Akron in Cleveland on Saturday as part of the Northeast Ohio Coaches vs. Cancer Classic. Pitt: Welcomes Virginia Military Institute on Friday.